Rakusan did not include the Fan Series in his main sequence numbering. Therefore, the original number used for each of the 36 Series prints has been modified to identify the Fan Series members of its theme. The five different fan silhouette shapes have been here assigned arbitrary numbers 1 through 5. To indicate a fan design these shape designations are added to the 36 Series number separated by a hyphen. 115-4 is the Fan Series design with fan shape 4 in the 115 Dahlia theme. Like all other designs in this series, 115-4 was only produced in a single print run, and few copies are currently documented. The 115 Dahlia theme is one of the many entirely regular themes represented by a complete fan quintet and a color woodblock print. 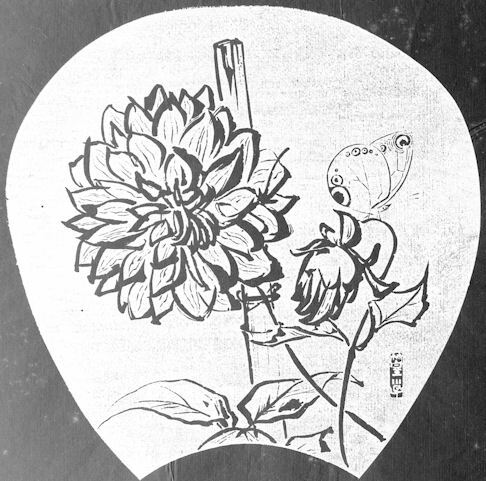 The Fan Series prints of the 115 Dahlia theme were distributed in mid 1934 in installment five (of twelve). The delivery documents for installment five remain to be discovered, but its delivery month was either July or August 1934. The woodblock prints would have been printed earlier in the same month as their distribution. 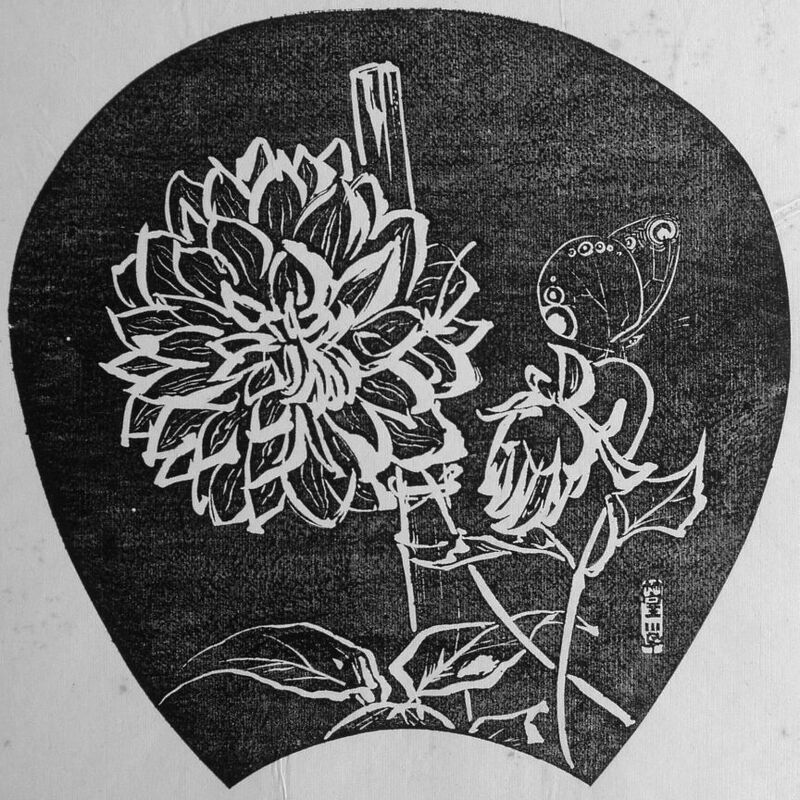 The Fan Series dahlia prints were carved in two stages. Three prints (including 115-4) have seal C from the first half of 1934, and the other two and the 36 Series design 115 have seal B which is later and closer to the time of publication. The composition of 115-4 includes two dahlia stems, one with a fully open flower and the other with a partly opened bud. The plant is supported by a bamboo stake. Sitting on the stem with the bud is a small brown-butterfly. All of the floral elements are rendered as sweeping, painterly, line drawings; and the butterfly is in a finer and more detailed style. Both styles look equally well viewed as ishizuri or as the reversed original. Rakusan was typically very detailed in his depictions of insects, and it is almost always possible to identify them to some degree. The small butterfly with eye-spotted wings shown in 115-4 can only be a satyrid (or satyrine) or brown-butterfly (family Nymphalidae, subfamily Satyrinae), 蛇の目蝶 , じゃのめちょう, ジャノメチョウ, janome-chou. [蛇の目, じゃのめ, ジャノメ, janome, means 'bull's-eye or double ring (pattern)' (lit. 'snake's-eye').] However, its wings have a pattern which does not closely match the most commonly encountered species. It is unclear whether or not Rakusan has taken artistic liberties with the spot pattern, or it is intended as an actual species which has yet to be identified. The brown-butterflies in 105-2, 113-5, and 115-4 are particularly similar.